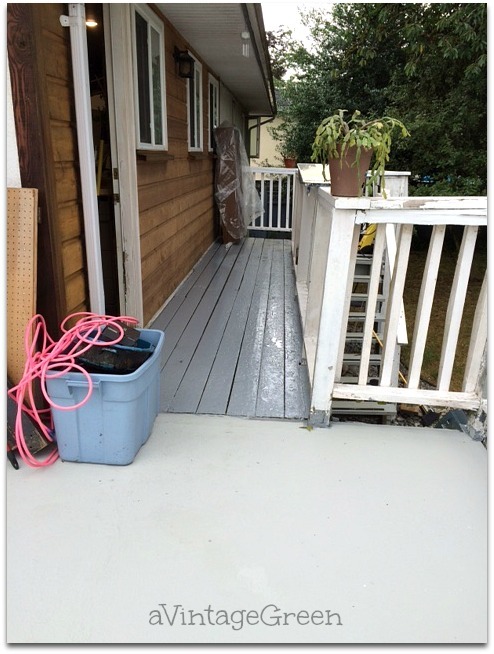 One of our summer pleasures tasks is keeping the outdoor wooden decks and stairs in shape and safe. The dahlia and garden pictures are reminders of spring and summer bounty. They have nothing to do with the work of prepping the decks and railings for maintenance. 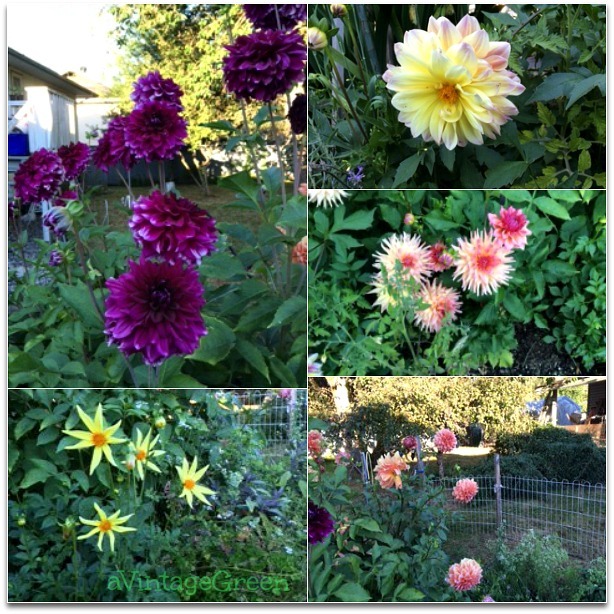 I was fortunate to have the dahlia's that I did not bring in over the winter to grow new stems and flowers this year. Our winter was so mild and spring warmth came in April and they grew without any help from me except for watering. First time this has happened in my dahlia growing history. My small garden was planted, watered, weeded and now happily has produce to share. I limited my garden to kale, tomatoes, carrots, beans and peas. Peas and kale have been good producers and my first tomato ripened this week. I have three blueberry bushes that have shared their bounty too. This year the last week of July and the first week of August were booked planned as the time for the hard work of maintenance. The weather was hot last weekend but under 28 C and dry. 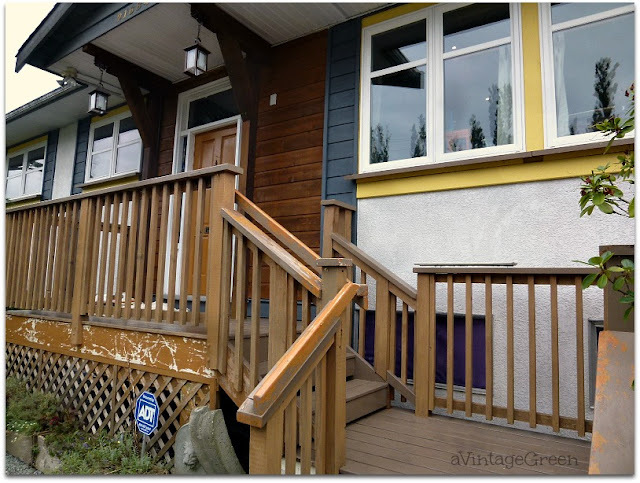 Our dear friend Val has been over many many hours to help us with the prep of the decks and stairs before painting and then she painted the cedar siding and front deck spindles,. 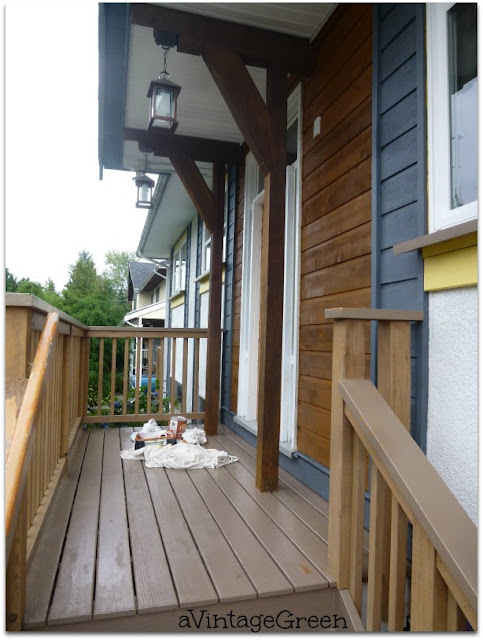 The back and front decks have been power washed and scraped to remove loose paint, the spindles were scrubbed of their green algae which is activated by our year round wet weather (coastal BC). Those two jobs have taken hours and days. The flaking paint areas had to be scraped away, sometimes down to raw wood. The repairs and painting of the spindles and rails are still on the list. 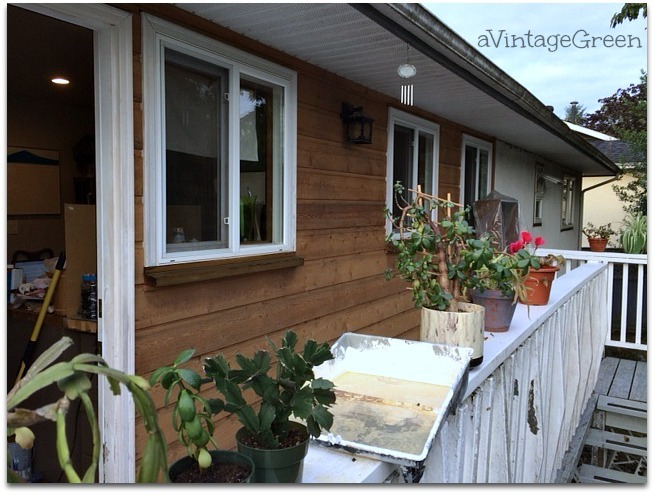 DH scrubbed the wooden deck from the back door to the outside steps, removing of an amazing amount of dirt and mould. You can see the painted area in the bottom left corner. It rained Tuesday and Wednesday so Thursday is the day DH will be finishing painting the wooden deck. Update - YES the wooden back deck has had 2 coats of paint and is finished. 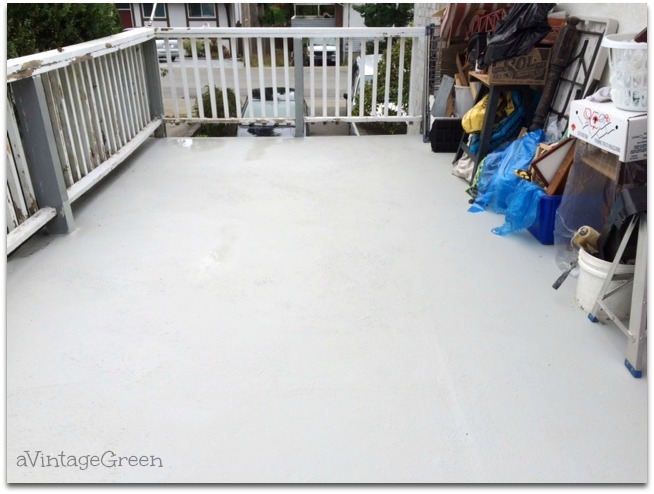 The carport deck floor was scrubbed, rinsed and DH recoated it with Deck Coat (a yearly job) to ensure that the carport ceiling remains water tight. Patching the few tiny holes around nail heads and splits remains and that is on the list. My piles of 'stuff' have been moved from one part of the deck to another during this work. I moved this lot under cover Monday night at 11 pm when I checked the weather report - rain ahead. DH and Val worked four days on these jobs while I was away with DS and DGS visiting family in Vernon. Last year our extra hard job was replacing stair treads on the back deck. This year they just need to be scrubbed and repainted, still on list. The cedar siding on the back of the house has been stained and the cedar siding area on the front of the house has been stained. Another job finished (thanks you Val). The big posts that support the porch roof were also stained this year. I painted the front steps and deck on Monday. It rained Tuesday and Wednesday so Thursday will be the day for the 2nd coat. Update: YES the 2nd coat was added Thursday afternoon. The spindles have been given 5 coats of stain. What is still waiting to be done? • clean up of thousands of large and very small pieces of dried out paint that have floated and stuck to the grass and the driveway. I am hoping the weed blower will help with that but suspect a rake and personal energy will be the solution. I am sure other jobs will occur as we finish the planned jobs. Now, if you read Linda's Life Journal blog you will know that LD and Linda share their home maintenance all year round and they have had some big jobs - trees falling, rain storm flooding and much more. Then check out Claudia's Mocking Bird Hill Cottage, always so much work to keep the gardens and yard and outbuildings up. So many of the bloggers I love visiting write about the work they do to keep their homes in good shape. 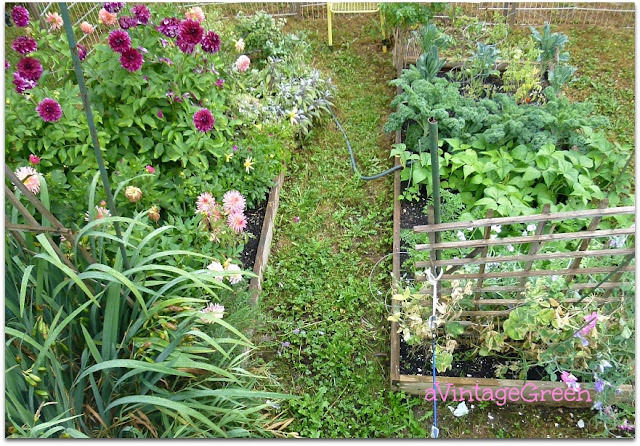 My sister Gail writes This Green Life blog and shares her gardens and all that is entailed. Sue of Granny Sue was canning her produce this week. 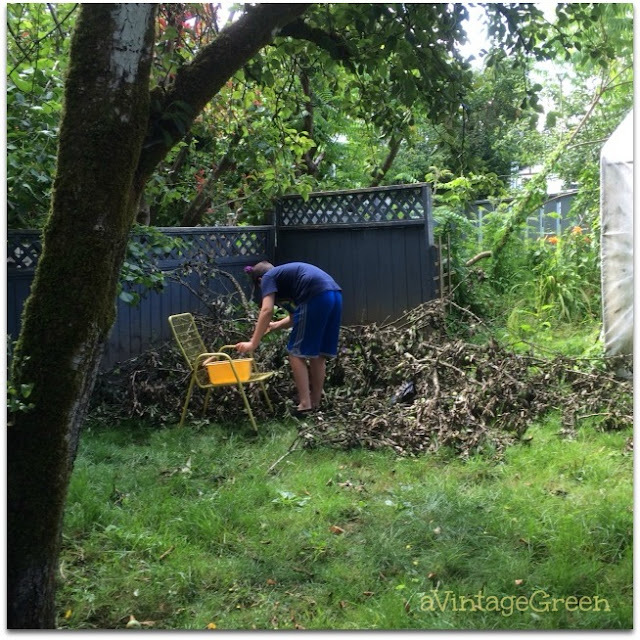 We did have to clean up the branches that broke off the pear tree and the thousands (I stopped counting at 2000) unripe pears that had to be picked up and put in the compost. The branches were cut up with help from DGS and we hauled them to the compost dump - 4 loads in the van spread over 4 days. A chocolate dipped large ice cream cone was his reward after each dump run. Cleaning up the front and back yards and the bagged debris from weeding and raking also went to the compost dump in each branch load. Not my usual type of post, I usually write a couple of home related posts each year on gardening, home maintenance, repairs. 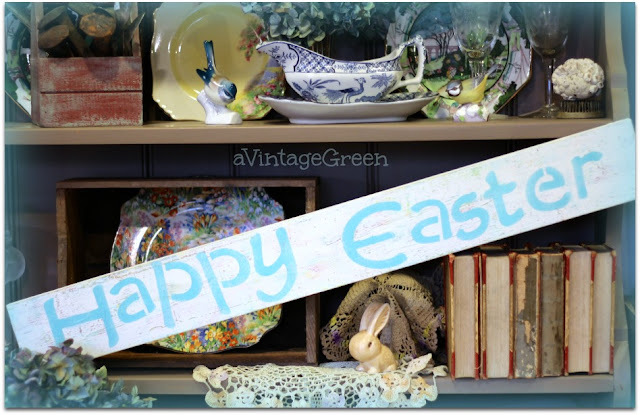 For me it is a visual journal of what was accomplished or what needed to be done to keep the home in good shape. Today is the first year we have not celebrated my Dad's birthday. He would have been 96 today. I miss him dearly but I know that he so very much wanted to be with his heavenly family. Some days are still tough but I just tell myself that Dad had a good long life and I did everything I could to make things work the way he wanted them to be. Good morning Joy! All of that outside "stuff" has to be done, doesn't it? Three weeks ago, we had an awful storm and I lost so many limbs. The city is picking up the debris today. But, I had no choice except to cut it up and move it to the front yard - not a pretty sight! But, at least it will be gone today. Your projects all look good. Keep up the good work. I can't work outside here due to all of the 100+ temps the last few weeks. The heat index have been 109-110. Too hot for me. Deck maintenance is a pain but worth the effort in the end. Gorgeous color choice on yours. Enjoyed pics of your flower garden! The bunnies here keep eating my blossoms so we're going with a green leaves theme this summer. Decks are nice but require too much maintenance for me. I can realte to the heat. In Texas today, it was 105 with 108 heat index. Stay cool. There's always something that needs to be done with a house. Outdoor maintenance is so important too. Looks like you've made a lot of progress! Joy your home is looking so good. It is a lot of work but so worth it I think. I'm a renter now and don't have a deck, I miss it! Enjoy the rest of your summer! Such hard work and you guys are doing beautifully! I am loving the color you painted it. We as bloggers have work to do even if its cleanups. Garden/yard work is always hard work. I couldn't be without a deck and think the work is worth it. Love the color you picked. My goodness you've all been so hard working taking care of your lovely home. Those were some big jobs to tackle and everything is looking wonderful now. You and your family have been busy. Everything looks great (will they come visit me??? Ha!). I love dahlias and I can't grow them here -- so pretty. Happy Monday! I LOVE your dahlias ... one of my Mom's favorite flowers. Your deck looks great. Outside work is never ending. I've had so many project planned, but never seem to get them done before new jobs pop up. I don't know how you get so much done. 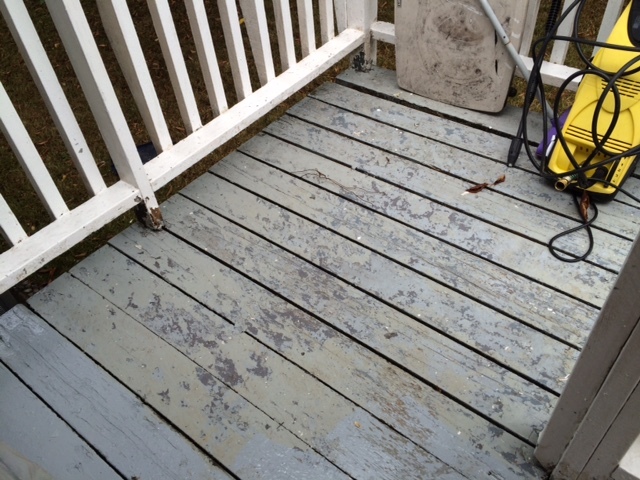 About 5 years ago we put on the TREX decking and it stays nice just sometimes needs some scrubbing. It was worth the money for sure. Your decks looks nice and I know how hard that is to maintain. Your flowers are lovely, mine have suffered in this Kansas heat. You have been busy with lots of jobs around the house. It seems the list is never ending here at home. I'm visiting from Mosaic Monday. The deck looks great! I love the flowers, too. Thanks so much for sharing with us at Funtastic Friday. There are always so many hard chores to keep up a home with property. We've been working on projects at this old house, too. You have accomplished alot! I'm visiting from Mosaic Monday. I really like both on nice days in the sun. House maintenance is a constant thing, we find. If it's not something outdoors, then it's something indoors. Your dahlias are beautiful. I've stopped lifting mine and they've come back for the past few years. (southern Vancouver Island) You've done a lot to your deck and it looks wonderful. Hello dear Joy, Thank you so much for your faithful comments and linking to my Blue Monday posts while I was on vacation. I arrived home today... tired but very happy to have been with so much family these past two weeks. I am also very happy to be visiting you today. I have to say your list of maintenance jobs completed is exhausting just to read about it. Smile. I am very impressed with all you accomplished. We too have much to do before winter. I am shocked at how many weeds grew in two weeks while I was gone. Yikes. The finished jobs look great. Good for you. I am so surprised your dahlia's bloomed again without digging them up. Dahlia's are so much work I do not plant them any more. I love journal type posts and I love seeing where you live. Looks wonderful to me!